If you like eating fish and are a fan of Thai flavors, you're going to love these delicious Thai fish recipes. Whether fried, baked, or grilled, there are plenty of recipes featuring the complex and sometimes spicy flavors of Thailand cuisine. From an easy fish curry to a whole fish with coriander-chili sauce to Thai fish cakes, you will be cooking up Thai fish dishes several nights of the week. Once you stock your pantry with the quintessential Thai ingredients, putting these recipes together will be a cinch. Learn how to pan-fry salmon simply and easily, searing in the flavors and omega-3 goodness of the fish. What makes this recipe so special is the tangy Thai lemongrass-honey sauce, including garlic, chili, and the ubiquitous Thai ingredient fish sauce. Considering the flavor complexity, you may be surprised to know that this recipe can be made in under 30 minutes, making it an ideal dish for a weeknight dinner. This soup is similar to Chinese hot and sour soup. In Thai, it's known as "geng som pla" (which actually means orange fish curry) and is an ancient recipe from the Central Plains region of Thailand. The first step is to make a flavorful paste including chili, ginger, garlic, and shrimp paste, and then stir-fry that until fragrant. When combined with white fish, shrimp, and variety of vegetables, all in a sweet and spicy broth, this soup is satisfying and healthy enough to be your whole meal. Banana leaves are readily available in Thailand and when wrapped around fish create the perfect encasement for steaming in the oven. This results in a moist and tender fish and helps the fragrant basil curry sauce infuse the flesh. Nearly any type of fish will work in this recipe, including salmon, red snapper, cod, and sole. The fish is first marinated and then dressed in the coconut sauce once cooked. With tomatoes, mushrooms, and green beans combined with salmon in a creamy curry sauce, this dish is both comforting and healthy. And as an added bonus, it takes only 20 minutes to cook—just process the curry sauce ingredients, bring to a boil, and add the vegetables and fish and let simmer until cooked through. A nice dish any time of year, but particularly warming during cool weather. These classic Thai fish cakes are surprisingly easy to make and are excellent served with rice and a special sauce. White-fleshed fish is processed along with a mixture of coconut milk, fish sauce, and spices, as well as traditional ingredients like kaffir lime leaves, galangal, and minced chili. They are then formed into patties and pan-fried until golden. Serving a cooked whole fish can be impressive, and give the impression you went to a lot of trouble. But it is actually the opposite—this recipe for whole fish with garlic-chili sauce couldn't be easier. Simply stir together the sauce ingredients and drizzle over both sides of the fish. Then wrap in aluminum foil and bake or grill until cooked through. A little extra sauce over top is the finishing touch. Don't let the ingredient list deter you—once you have your Thai pantry stocked, this recipe is a cinch to put together. The fish is first marinated in a mixture of coconut milk, fish sauce, dried chili, and coriander and then pan-fried until the flesh is opaque. The highlight of this dish is the topping, made of toasted coconut, chili, garlic, ginger, green onion, sugar, and lime zest and juice, adding wonderful texture and sweet and tangy flavor. This traditional recipe for whole fish can either be fried or grilled. In Thailand, small whole fish are used for this dish, so you may want to choose either a few rainbow trout (one per person) or a whole snapper. Once the fish is cooked, it is dressed with a delicious sauce of tamarind paste, garlic, galangal, coriander, fish sauce, and red chilis. Although this recipe is as simple as mixing together the sauce ingredients and pouring over the fish to bake, it will have your guests or family thinking you spent hours making this delicious dish. 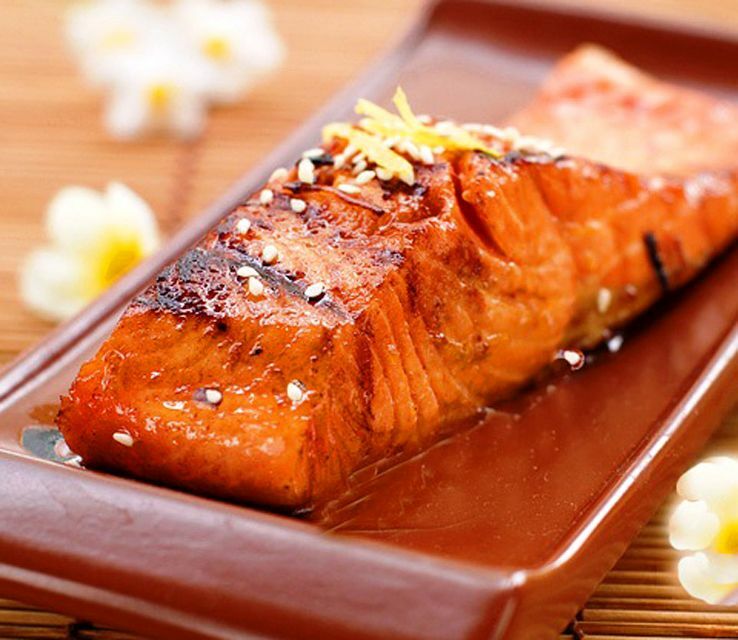 The salmon cooks in a black bean sauce that is enhanced with garlic, sherry, galangal, lime juice, fish sauce, and fresh red chilis, creating a richly colored and flavored coating on the fish. This recipe calls for fish steaks such as swordfish, but you can also use fillets of white fish like halibut or trout. After the fish is pan-fried to a nice golden brown, it is topped with a fresh no-cook (but warmed) lemon-herb Thai sauce that is flavored with plenty of fresh coriander, fish sauce, coconut milk, and chilis. Delicious served over rice and is simple enough to cook on a busy weeknight. Although the ingredient list is a bit long for this recipe, the process of making it is quite quick. All you need to do is put all of the curry sauce ingredients in a food processor and blend until the sauce is fragrant and has a somewhat smooth consistency. Then simply pour over the salmon, cover, and bake. You can also cook and/or serve the fish in a banana leaf boat for an extra-special presentation. In Thailand, this dish would be steamed instead of baked, but baking it is easier and the results are just as delicious. The main ingredient in the sauce is tamarind paste, which is made from the fruit of the same name and imparts a sour-sweet flavor to the dish with tones of chili, garlic, and ginger. Another simple recipe where the fish is baked directly in the sauce. In coastal Thailand, fresh fish is plentiful and delicious grilled or steamed in a wok. Try this steamed version combining lemongrass, galangal (or ginger), and fresh coriander for a melt-in-your-mouth taste experience. A bamboo steamer is handy to have for this recipe, which fits nicely inside a wok or large pan. Lemongrass and coconut combine with lemon, honey, and a bit of garlic and chili to make a sweet, sour, and spicy sauce, perfect over grilled salmon. The salmon steaks are marinated in some of the sauce mixture before it's cooked, and then the remaining sauce is thickened and spooned over the fish for serving. This grilled fish recipe starts with a superb garlicky barbecue sauce that's perfect for all types of fish, whether fillet or steak, salmon or sole. All you need to do is marinate your fish briefly in a sauce made of soy sauce, oyster sauce, fish sauce, garlic, lime, and chili, and then simply grill the fish until tender. As a bonus, it's a very healthy fish recipe that's low in fat and calories but extremely high in taste. This Thai recipe for grilled halibut steak is simple to prepare, making it perfect for a weeknight, but also impressive enough for a dinner party. As long as you use thick, meaty fillets or steaks, you won't have to worry about the fish sticking to the grill grates. The sauce mixture—a combination of chili sauce, fish sauce, soy sauce, coriander, garlic, lime juice, and sugar—does triple duty, acting as a marinade, a glaze, and a dipping sauce. From its name, you may think this recipe calls for cooking the fish in alcohol, but the term "drunken fish" actually references the fact that this dish is often served as bar food in Thailand. Compared to typical American pub grub, however, this recipe is quite elegant. Whole fish is dredged in flour and then fried until crispy. It is served with a sauce tinged with the flavors of lime, fresh coriander, basil, and chilis.